@dot_Sp0T package has arrived! Thank you! Thank you! I'm gonna have to bring my German back up to date to catch up on the "local" news. You packed the cocoa in two newspapers (which I'm assuming is in German). @dot_Sp0T Please do. The texture of Taza is unusual, just be ready for that. Btw how you like it? @dot_Sp0T I'm still at work. I won't get to try it till this evening when I get home. @dot_Sp0T We have a large dairy industry, yes. I believe my wife has some milk in the fridge now (no idea how old it is though). Mixing hot chocolate with water is gross. I mean, you can do it in a pinch but....yick. @dot_Sp0T My guts don't like untreated dairy but there's lactase pills to break down the lactose. I'm not allergic but the pills are very helpful. @Green you know, thinking about the tectonic map, I feel like maybe @AndyD273 was the one that modified it to show those lines. @dot_Sp0T had we talked about you guesting on the podcast before? as i recall our next episode will be some further discussion on creating sentient races. @James maybe elephant people too. What if the entire world was humanoids?!? By some decree of the Gods, every creature was a humanoid. I don't think this is a great idea but it just popped into my head. I think you still need non-sapient creatures...it gets weird when one sapient eats another. You can always have non-sapient humanoids. 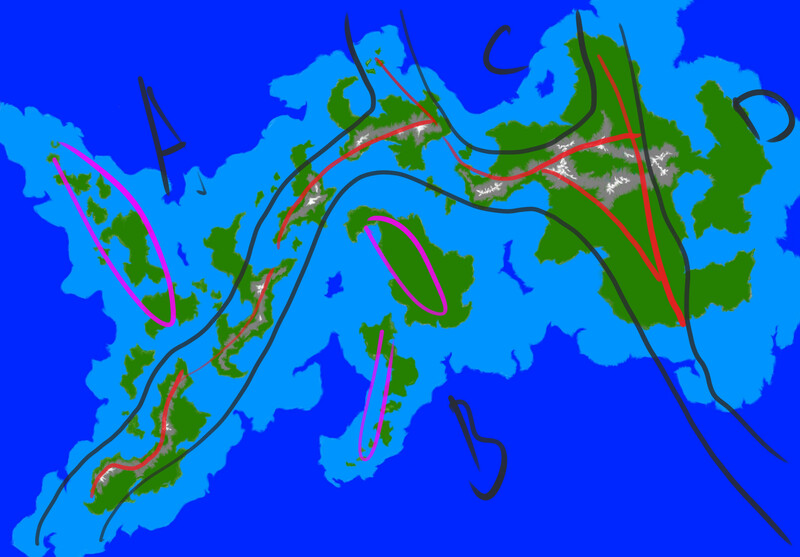 @james I'll add the tectonics map this weekend. @James Yeah... I'd agree. It would probably get tricky if there was a possibility of having a conversation with your next meal... Sounds like cannibalism, even if it's a different species. @AndyD273 That would be really interesting (a la the cow that wants to be eaten in Restaurant at the end of the Universe) or horrifying (a la the hart that says it doesn't want to be eaten in CS Lewis' Silver Chair book). There's a line in The Amazing Maurice and His Educated Rodents where the cat catches a non talking mouse, but has to double check that it's not sentient, so he holds it down and says "Ok, just say one word, and I'll let you go..."
@AndyD273 that kind of happens all the time in Chronicles of Narnia (the talking animals part. I don't recall a scene where a talking predator takes prey then has to decide if it's also a talking beast). @Green I think they kinda avoid that problem by having the talking animals look different from the non-talking ones. Like bigger than normal for instance. I don't know how you'd figure it out otherwise if you were going bow hunting or something. Maybe the talking deer wear orange vests? @AndyD273 ...and carry guns themselves? Calvin and Far Side... The world has diminished since my childhood. Many people find that Frazz is a good imagining of what Calvin would be like as an adult. @Green Yup. That ones not bad. Ever since Yahoo Comics shut down I've kinda lost touch with them. @AndyD273 I only know of them from the books that get published occassionally. I don't read the paper so I don't see them day to day. @AndyD273 amazon has a few.